My husband seriously loves mums. There is something about seeing all those bright, fluffy flowers in pots at our local garden center (and really, just about everywhere else) that makes him super happy. It might be because he’s just a fall guy, and he’s ready for a break from the summer heat. Maybe he’s looking forward to apple pie and pumpkin-everything. I’m pretty sure the biggest reason he loves mums is because that means it is finally football season! Anyway, we’re starting to see fall flowers around our town and so I was inspired to tackle making my own quilling paper mums. They ended up being a little trickier than I thought. In fact, this might be the most complicated quilling tutorial I’ve produced to date. Not difficult (don’t worry about that, beginner quillers! ), just a little on the long side with a lot of steps. But I have faith in you, paper people! You can handle this! After a couple rough tries, I decided to make my petals a few at a time on my quilling comb. Now, you could make every single petal of the mum on your quilling tool individually, but it might literally take forever. Trust me when I tell you, even know it seems kind of a pain and it might be a little tricky making a bunch of loops on the quilling comb, you will save time, and it is definitely the way to go. Follow along with me on this tutorial; I will make it as easy as I possibly can. OK, are you with me? Your first step is to roll the base of your flower. I chose a darker leaf green for the base of my mums. Glue 2 24″ strips together and roll into a tight coil. Next, form the coil into a indented bowl shape by pushing in the middle with one of your fingers. Add a small amount of glue to the inside of the bowl, and spread with a paint brush. Set aside to dry. Moving on to the petals. Holding your quilling comb, place strip of quilling paper along the back, with one end right at the edge of the comb. Pull the other end through to the front of the comb at the 5th prong, and bend the strip back to the edge again. Fold the strip back on itself, and pull the strip back to the backside of the comb between the 5th and 6th prong, right next to the first loop. Loop the strip around 2 prongs, pull the end back through to the other side, and bring the strip back to the edge again. Fold the strip back on itself once more, and pull the strip back through to the other side between the 7th and 8th prong, again right next to the previous loop. Loop the strip around 2 more prongs, and pull the strip back to the edge of the comb once more. When your loops are done on the quilling comb, tear off the remaining strip of paper, keeping all the loops together. Carefully slide the loops off the comb, and glue all the ends together. You’re going to need a whole bunch of these petals. I used about 18 for each flower. Now, you could just use the mum petals just the way they are now, but I wanted to make them a little more realistic. Hold each petal between your thumb and the side of a needle tool (similarly to using the blade of a pair of scissors to make ribbon curls). Pull down the length of each section, almost to the end. The petals will stay in this new shape; no glue is needed! It’s time to build your flower! Start by gluing 3 petals, separating the base into 3 segments. Fill in one segment at a time with petals for the most natural look. The petals may overlap a bit, but that’s fine! Continue adding petals until the base is covered. >TIP: Brush away any excess glue from the underside of the petals for a clean and polished flower. Now, we just need to fill in the center just a little bit with a few extra small petals. 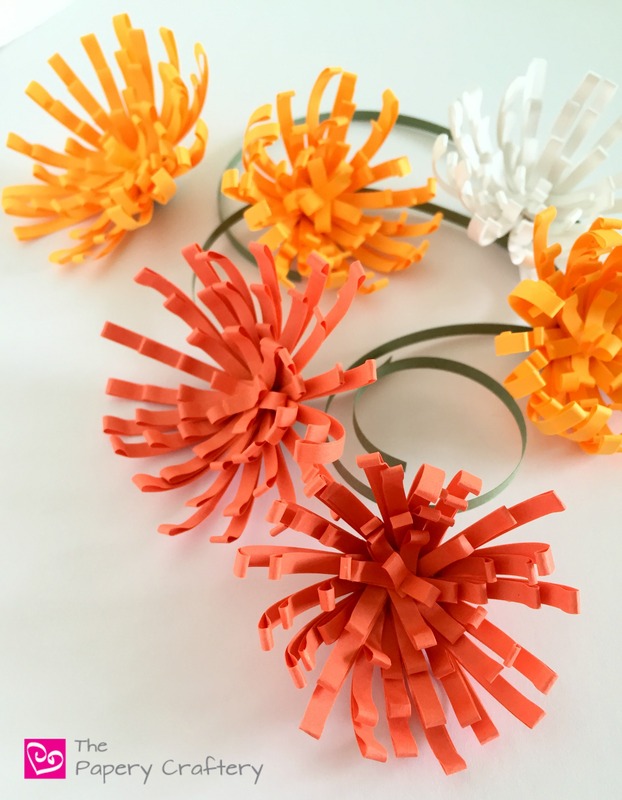 Using about 1/2″ strips of quilling paper, make 5 small loops. Curl them in the same way to the rest of the petals and glue in the center of the mums. Make a double loop for very center of your mum. TIP: Dip small pieces in glue and use needle-nosed tweezers when quilling in tight places! That’s it! I promise these will get easier with a little practice! Be creative with your colors! Mums come in an amazing array of different fall shades! One of the best parts of this design is that you can use the same technique to make different size blooms. Simply spread out the petals for an open flower or keep them more towards the center for a smaller bud. I love these big, beautiful blooms! You could even use them along side of my quilling paper acorns for the ultimate autumn quilling home decor project! Let me know how your mums turned out. Leave a comment below to wow and inspire!